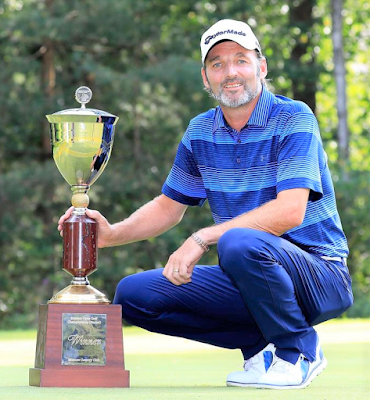 David Shacklady secured an emotional victory at Moscow Country Club on Sunday as a final round 69 gave him a two-shot triumph at the VTB Russian Open Golf Championship (Senior). The Englishman finished on eight under par, two shots clear of Welsh duo Stephen Dodd and Phillip Price, the latter of whom led after both the first and second rounds in Moscow but posted a one over par 73 on Day Three. Shacklady began the day two shots behind overnight leader Price, but took the outright lead after the front nine on Sunday thanks to three birdies going out before navigating the back nine in level par. “It’s just unbelievable. I’ve been playing great. I played great in the last event at the London Golf Club. I spent some time with my coach Simon Edwards and it felt great there and I’ve brought it here. The 51 year old has three top 20 finishes to his name prior to this week’s event but he admits to feeling frustrated and putting himself under too much pressure in previous weeks. “I’ve been frustrated that I’ve not really got to where I feel I can play, my level,” he said. “I’ve perhaps done a bit too much leaderboard watching, a bit too much pressure on myself and I feel like I’ve been playing catch-up at every event. Shacklady, who dedicated his win to John O’Connor, a friend and former colleague at Ormskirk Golf Club in the north of England who recently passed away, admits he’s having ‘the time of his life’ on the Staysure Tour. “I’m having the time of my life,” he said. “I’ve watched these guys on TV all my life so playing with them is just a dream to start with. To contend with them and now to win is unbelievable. Williams carded the low round of the week on Sunday, signing for a six under par 66 after carding rounds of 73 and 75 on the first two days. The Staysure Tour will now visit Hanbury Manor Marriott Hotel and Country Club for the Willow Senior Golf Classic between August 24-26.